In the late 26th century, the overpopulation of Earth reaches the breaking point, and humanity must find new frontiers to call home. Knowing that this time would come, Earth has been in a centuries-long terraforming process of Mars, introducing moss and cockroaches to hasten the transformation. Three missions travel to Mars to see the results of that terraforming, and what they discover is the horror called Terraformars, giant humanoid cockroaches. As Terra Formars, Vol. 14 (Chapters 130 to 140) opens, the Chinese ship, Kuzuryu, prepares to leave Mars with its precious cargo, the kidnapped Akari Hizamaru and Michelle K. Davis. One of the kidnapped makes a sacrifice to save the other, but its Sylvester Asimov to the rescue. Meanwhile, the other survivors of the Earth-to-Mars missions hope to get to a rescue ship from Earth. Do they know that the Terraformars have already reached Earth and have been there since 2604? THE LOWDOWN: The Terra Formars manga is in the middle of an exceptional run. The series has long moved away from the humans vs. monsters scenario to present a portrayal about survival and motivation that is complex. 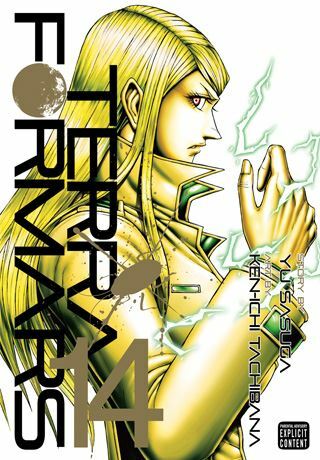 Terra Formars Volume 14 advances previous scenarios and presents new one. Creators Yu Sasuga and Ken-ichi Tachibana throw explosive sequences at the readers, especially those featuring the Terra Formars on Earth. I want to read the next volume for that alone, but the block is hot on Mars, too. I think these recent volumes are a payoff for longtime and loyal readers. POSSIBLE AUDIENCE: Fans of seinen manga and monster comics will want to try the VIZ Signature title, Terra Formars.